Kip Marina: Temporary berthing Group rates are available to fleets of 5 boats or more. The ultimate base on the Clyde: nowhere compares with Kip Marina – premier in Scotland. Set in a beautiful and sheltered basin, it is perfectly positioned for access to Scotland’s finest cruising grounds. We pride ourselves in the standard of customer service. Kip Marina’s engineers or their chosen contractors offer an unrivaled depth of experience for servicing and keeping your boat up and running. 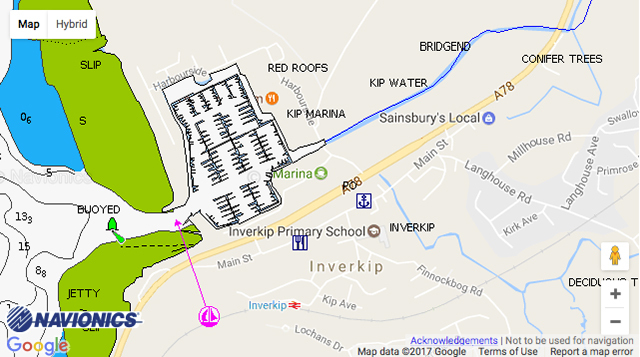 Inverkip Village and nearby Greenock provides a swimming and leisure centre, multi-screen cinema, restaurants, and a selection of shops and supermarkets. Road and rail links give easy access to the city of Glasgow and its airport.